Bees Relocated from Schoolhouse Floor! Saturday August 18: Mike Burke, Steve Kennerly and Midge McGinnis of The Friends met with Phil Moulton and other wonderful members of Beekeepers Association at the park to relocate honey bees that were living in the floor of the schoolhouse. 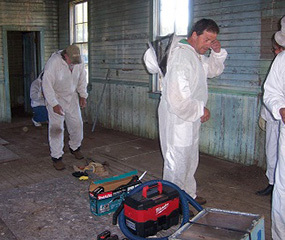 The floor was cut and trays of bees and honey combs were successfully removed to be relocated. 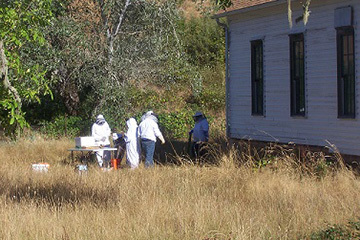 Bees also living in a duck box in tree next to the schoolhouse were also removed and relocated. Such an amazing group of folks working on those bees. We are getting ready to start work on the interior. We have received a $20,000 grant from Kinsman to continue restoration of the schoolhouse! Rocky Houston, County Parks Director has organized Volunteer Work Parties to remove invasive Hawthorn. During your next visit you will notice the cleared pasture and trails along the creek. Individuals are still working on this project! 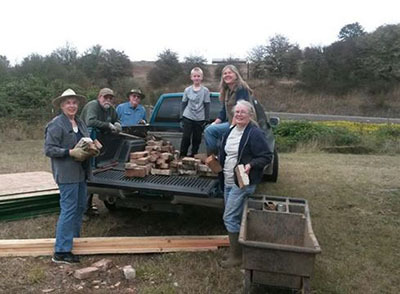 Volunteers Midge McGinnis, Holda Carter & Susan Rodan happy to be at the work party January 2017. These trees will not require deer protection but will require watering the first summer, but not after that. Roseburg OET and The Friends have generously agreed to split the costs of watering bags and a few hoses, so we can keep these trees watered this summer. The bags will be placed around the trees soon. Call Leslye Wing 541 849-9155 to sign up for watering during the summer. Just one day will be a big help! What’s next? We purchased thirty 4-5 ft tall bareroot Big Leaf Maples (Acer macrophyllum) and ten 3 ft tall Sycamores. The plan is: grow in 5-7 gallon pots during summer 2017; Plant in the campground in Fall 2017. Will require deer fencing and a watering system for a few years. This is a large native tree which grows quickly and is a great shade tree. We hope to transplant Incense Cedar seedlings that are dug up from other locations in the park or obtained from local BLM or Forest Service land, and plant around the campground. There is no plan for water or deer protection for these trees. Please contact Leslye Wing leslye@mildredkanipepark.org for more information. Thanks to Tyee Outdoor Experience! Visit Geocaching.com and search for caches at the Park! Working with Douglas County Dept. 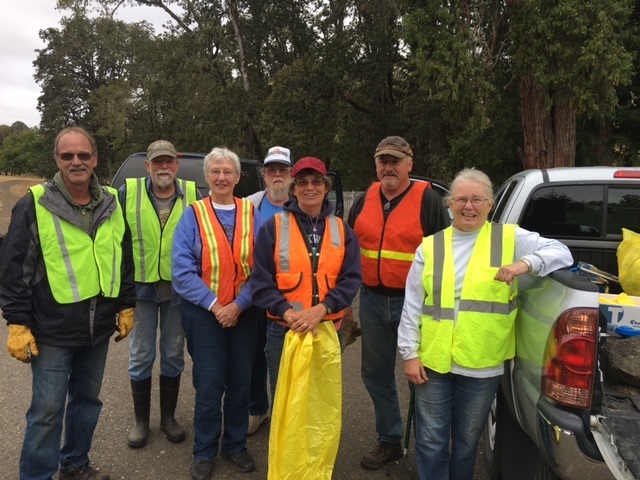 of Public Works Adopt-a-Highway Program Elkhead Road along the park is earmarked for litter clean-up. Rita Prothero (of Tempa, Temporary Assistance of Sutherlin) has stepped up as project leader. Below are pics of September 21, 2016 trash pickup. In 2014 The Friends received A Certificate of Acknowledgement from the Douglas County Commissioners in recognition for our dedicated service! Thank you Rita for your leadership! Mildred Kanipe's House makes Restore Oregon's Most Endangered Places list. 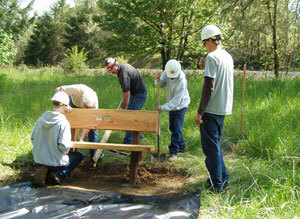 Restore Oregon identifies important structures in Oregon that everyone agrees is important and must not be lost. Restoration projects have value in terms of preserving our history and culture, creating jobs, tourism, and Oregon as a travel destination. Finished restoration projects help to revitalize the surrounding areas and benefit business development. We are so pleased to have been choosen to receive help from Restore Oregon in preserving Mildred's childhood home. The final report of the ground penetrating radar survey by the University of Oregon Museum of Natural and Cultural History in October is now finished. The survey established the boundaries of an historical cemetery and identified graves within the cemetery located in Mildred Kanipe Memorial Park, located on Elkhead Road, Oakland, Oregon. Friends of Mildred Kanipe Memorial Park Association, the Douglas County Genealogical Society and the Douglas County Prospectors Association also participated in the survey work. Friends of Mildred Kanipe applied for and is grateful for the Oregon Heritage Grant from the Heritage Conservation Division of the Oregon State Parks and Recreation. With the survey’s completion, Friends of Mildred Kanipe will begin the process of securing grants and donations to build a fence around the cemetery to protect and honor the graves of these early Oregonians. The cemetery preservation is a major priority because of its high archeological and historical value. The cemetery provides evidence of settlement in North Douglas County and is a record of the area’s economic development, early population and settlement activities, and how our ancestors’ survivors organized our present day landscapes and preserved social values. When Mildred purchased the land she took her cat and bulldozed the grave area, obliterating the evidence, "because she didn't want people snooping around on her property." Mildred had asked that the markers be restored after she died. The location of the historic gravesite could not have been accomplished without the generous help of the Douglas County Chapter of The Gold Prospectors Association of America. Five members from the organization conducted a through search of the area using metal detectors. They concluded that this was undoubtedly the location of the burial site. Members conducting the search were Gary Sturgill, Chapter President, Carl Stone, Gary Grass, Michael W. Taylor and Robert L. Pace. The Friends would like to express our thanks to these individuals for their time and efforts, in helping solve one part of the mystery surrounding this burial site. We had another fun run in 2016. Extra challenge with the rain! Please visit Mildred's Trail Dash Page. Look at that ROOF!!! Isn't it beautiful!? 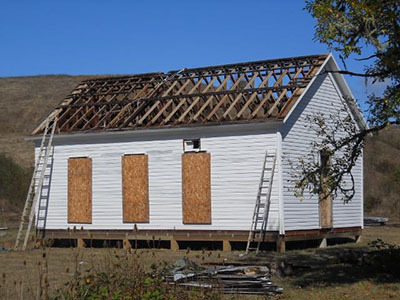 A grant from C. Giles Hunt Charitable Trust was used to replace the roof on the Schoolhouse. The Friends are extremely grateful for the continued support from the C. Giles Hunt Charitable Trust. 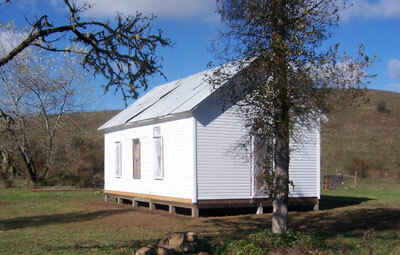 Another grant from Preserve Oregon – Oregon Heritage Commission in the amount of $7,500 was also used for the roof and window restoration. In 2013, the windows were repaired. 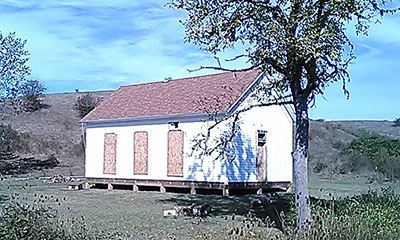 In the fall of 2011, the schoolhouse was lifted 5 feet in the air and a new foundation was installed, in addition to shoring up the bottom beams and floor. Please see our facebook page for more photos. Grants from the Kinsman Foundation, the C. Giles Hunt Charitable Trust and Cow Creek Umpqua Indian Foundation emabled us to complete this work. We are in the process of requesting more grant money to continue work on the Schoolhouse Restoration which will include cleaning and restoring the inside walls, floors, windows and doors. A restroom and parking area will be the last items needed. Click here to see the preliminary Schoolhouse Renovation Plans from Tom Rodgers - Engineer from Roseburg. 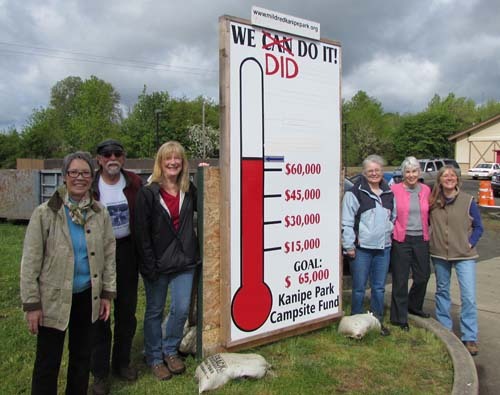 On April 27, 2014, to help build an equestrian and non-equestrian campground project, The Friends announced that they reached the $65,000 Fund raising goal for in less than three months. In January 2014, Douglas County officials proposed a 20 acre clear cut in the Park to raise an estimated $150,000 for the project. Citizens and organizations asked the Douglas County Commissioners to let Friends of Mildred Kanipe raise private funds to avoid the logging. The Commissioners agreed, and gave Friends of Mildred Kanipe six months to raise $65,000 to be matched with additional funds for the project, including $65,000 from the Mildred Kanipe Trust. Board Members happily standing next to "We did it!" thermometer in Oakland. Karen Roberson. Not pictured: Leslye Wing, Debbie Levings and John Robertson. The additional mile or so of trail has been cleared on the 40 acres on the other side of Elkhead Road (and yes, it is part of Mildred's park). 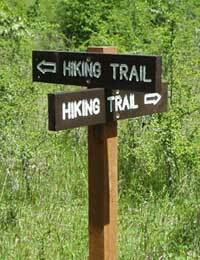 New signs to direct people to the trails have been installed by Volunteers from Umpqua Hiking Club. This trail will be for hikers/walkers only. No horses. 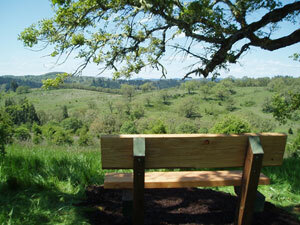 Installed Summer 2011: Benches on the nature trail and at the top of the hiking trail, in memory of Richard Sommer, who loved nature. Thanks to Friends of the Umpqua Hiking Club, Ray Jensen, John Mallone and the Wolf Creek Job Corps. 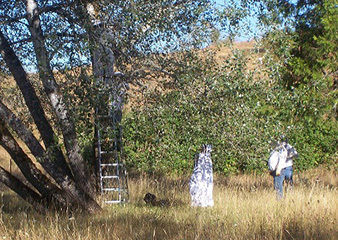 Celia Scott is heading a project to work with Gregory Flick to clone the old trees in the apple orchard in the day use area. Stay tuned for more info on grafting clinics and progress! Young heritage apple trees have been obtained for planting in the fall. They are the following kinds: Star King, Yellow Transparent, Winesap, Baldwin and Pippin. Sadly, the Dairy Barn was pulled to the ground in September 2011 by Douglas County. The metal roof was collected and recycled. Some wood has been salvaged but the rest was burned by the county. Jim Dowd had taken the photos of exterior and interior for reference and historical purposes.